Fiat’s versatile, van-based Doblo MPV has been given an overhaul with updated styling, new equipment grades and tweaked driving dynamics. The updated Doblo will be available from January 2015, with pricing from £13,480. The most obvious changes are at the front, where there are slimmer, smaller headlights, along with a wider grille and a redesigned bumper. Othe changes include new rear light clusters, plus there are new alloy wheel designs and new colour options. As before the Doblo is offered with a choice of two roof heights, in five- or seven-seat layouts. The five-seat model has a large, 790 litre boot which can be expanded to a colossal 3200 litres with the seats folded. Three engines are available – a 95PS 1.4-litre petrol, or a 1.6-litre MultiJet diesel with either 90PS or 105PS. There's no news on emissions or economy, but figures shouldn't change too much. The most economical variant of the outgoing model is the 90PS diesel, with an official figure of 56.5mpg and emissions of 133gkm. Driving dynamics have been lightly tweaked, with a slicker gear change, new instruments, a more responsive throttle and improved sound-deadening. The UK trim range has been changed, with ‘Pop’ forming the entry point. 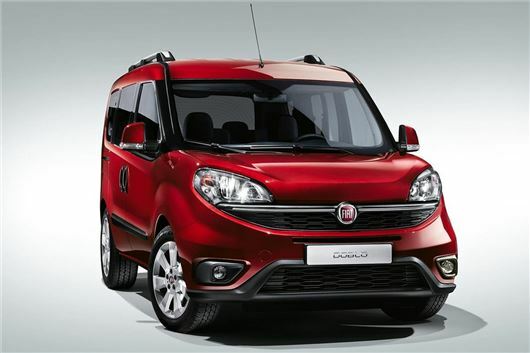 Pop models cost from £13,480 and come with stop/start, remote central locking, electric front windows and hill hold. Mid-level Easy models get steering wheel mounted audio controls, body-coloured bumpers and electrically adjustable door mirrors. Easy Air trim adds air conditioning. Eleganza models get 16-inch alloy wheels, rear parking sensors, a better audio system, Bluetooth, Aux/USB connections, rear electric windows, power folding door mirrors and cruise control. Eleganza models cost from £17,980 with the 1.6-litre 105PS diesel engine.